Ever sat around and said, “Wow: I wish I could help my kids make an electro-didgeridoo.” Or, why think small? Why not a whole Electro-Skiffle Band? And, sure, not all of us are into music. So maybe you’ve always wanted to make a water rocket with your children, but you just didn’t know how. I’m kidding, of course. 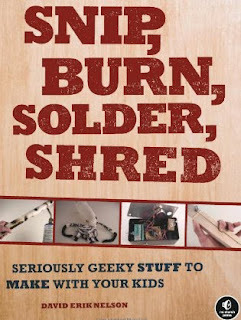 Most of us would never even conceive of making any of the stuff in David Erik Nelson’s Snip, Burn, Solder, Shred (No Starch Press), let alone involve our poor, unsuspecting kids. Yet Nelson makes it all seem not only accessible, in many cases, he makes it look easy. … the Putt-Putt Boat maneuvers around a bathtub or swimming pool under its own power with no moving parts, driven by a simple, valveless flash boiler made from a coil of copper tubing and a rudimentary alcohol burner. Never mind the kids at this point, right? A flash boiler? I wanted to make this one myself!